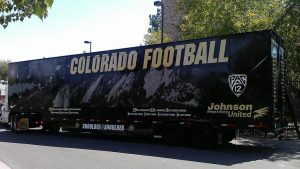 The University of Colorado, Boulder, and Johnson Storage & Moving decided to deploy the CU Buffaloes-wrapped truck, fully loaded with relief and recovery supplies to Houston, TX in the aftermath of Tropical Storm Harvey which devastated the area last week. 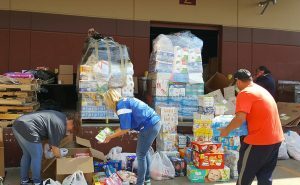 On Wednesday morning, September 6th, the truck will be accepting donations from the community between 7:00-11:00 a.m. at the corner of Discovery and Innovation Drives at CU Boulder East Campus in Boulder, CO. The logistics to get the truck loaded, approved to enter a disaster area, and to coordinate with the American Red Cross on the receiving end in Houston along with a national holiday in the middle, did not slow the Johnson team from getting the much-needed supplies onto the truck which starts its 1,000-mile trek in the late afternoon on Wednesday, September 6th. Between financial donations secured through Johnson, CU Boulder and other area businesses, the truck will contain cleaning and pet supplies, toiletries and personal items, as well as non-perishable food. Donated items will be transported to Houston by Johnson Storage & Moving drivers using the CU Buffaloes Football trailer. Johnson is sponsoring the transportation to get these much-needed supplies to Houston, a city that saw 1 trillion gallons of water dumped on it in four days. Johnson’s port of call agency in New Orleans, Louisiana knows all too well what’s needed after their experience with Hurricane Katrina and they contributed to the list of useful supplies being sent down. This is not the first time that CU and Johnson have teamed up to give back to communities. Johnson has relocated hundreds of CU’s faculty, is a perennial sponsor of the CU Buffs and has given back a percentage of those costs to the university. Johnson Storage & Moving Company is a global logistics company owned and operated by fourth-generation members of the Johnson family, who founded the business in 1900. Unique among moving companies in America, Johnson was a founding agent of United Van Lines (America's #1 family movers®) as a co-op van line in 1947. From its founding in Denver, the company has expanded to multiple locations spanning seven states: it has grown to include Security Van Lines (an agent for Mayflower Transit), in addition to the twelve Johnson Storage & Moving (an agent for United Van Lines) facilities with residential, commercial and FF&E/hospitality operations throughout Colorado, Wyoming, New Mexico, California, Louisiana, Kansas, and Texas. In 1997, Johnson International was created to provide global moving services for families and to assist companies relocating employees around the world, in particular Europe, the Middle East, Mexico, and South America. The addition of Baron Worldwide in 2010 further streamlined international freight operations, ensuring no move is too large or small.